Back to nature: Is ‘rewilding’ for you? A new movement trades in the comfort of modernity for the serenity of nature. WASHINGTON — Have you ever sat in gridlock after a long day at work and fantasized about what life would be like far away from traffic? Or perhaps escaped on an especially epic camping adventure and threatened to never return? And they are not alone. Rewilding is gaining some traction throughout the globe, says rewilder Kevin Park. Park, co-owner of We Are Wildness, helps city folk reconnect with nature. This can be as simple as taking a weekend hike, camping under the stars or simply taking off your socks and shoes to feel the earth underneath. “Whether you’re in a city or living out in a rural area, you can still find somewhere that has some nature in it — maybe some bird watching or sitting by a pond or going for a walk in the woods,” he says. Park escaped city life years ago after feeling suffocated and unhealthy. He was battling depression, but says he didn’t know what was causing him to feel so distressed. He turned to a natural diet and discovered the concept of rewilding. “Nature became a huge part of my process to be happier and healthier,” Park says. Park lives in a cabin on Vancouver Island, in British Columbia, Canada. He is about 20 minutes from a small resort town, three hours from the nearest city. But with the mountains, ocean and quiet, Park says, he has everything he needs. “Ultimately, this is the way we’re going to be able to become the best versions of ourselves,” he says. Park admits that his lifestyle isn’t for everyone. And when he watches “Live Free or Die,” Parks sees a kind of extremism that might be off-putting to even the most avid camper. Thorn, for instance, is a tattooed, bearded Viking stand-in who calls the wilds of the Blue Ridge Mountains home. 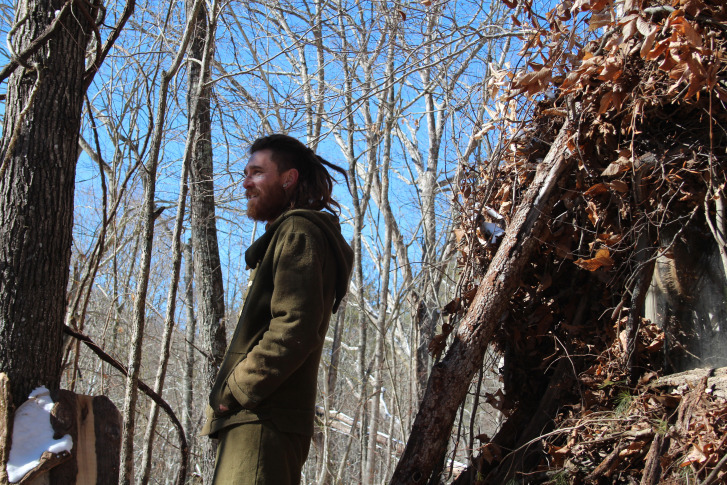 His only shelter is a hut built from twigs and leaves that took about two days to construct. “This forest gave me a unique opportunity to get away from that,” he says. Now, Thorn forages berries and mushrooms for food, or cooks up squirrels when he’s able to catch them. “I’ve eaten some pretty sketchy stuff,” he says. Read a book: This might sound counterintuitive, but Park says many authors are writing about their own adventures in rewilding. Picking up titles such as “Unlearn, Rewild: Earth Skills, Ideas and Inspiration for the Future Primitive” can help ease the anxiety of a lifestyle change. Take a hike: Whether it’s checking out the trails inside Rock Creek Park or Skyline Drive, nature is easy to find in our region. Instead of staying indoors this weekend, considering hopping in the car and exploring new territory in the great outdoors. Your couch and TV will still be there later, and might feel more gratifying after a day outside. Jump on a bike: Bicycles are another great way to escape outside and also save a little money. Pick up a new hobby: Fishing, bird watching, hunting, even photography, are great excuses to spend a day in the park or by a lake. And then you get to brag all over social media and show off those beautiful mountain shots. Go camping: The D.C. region is brimming with camping spots. As the weather cools down, you might consider heading south, where temperatures are warmer. When the summer gets steamy, check out mountain terrain for cooler climates. And if it’s snowing, rent a primitive cabin to get the outdoor feel without coming down with hypothermia. Participate in the We Are Wildness 30-day challenge. Sign up online — yes, you can still use technology — and receive a nature-themed challenge every day for one month. Share your progress with friends and other rewilders. Catch “Live Free or Die” Tuesdays at 10 p.m. on National Geographic Channel.